Terrinoth is a land of magic, mystery, and adventure. It's rich literary landscape that lends itself naturally to quests and open-world exploration for heroes of all sorts, including the dwarf brawler Brigid who has been adventuring throughout Terrinoth in our stead. During Brigid’s exploration of Dragonholt Village in our last preview, she gained a quest from the local smithy, Fiore. She has hired Brigid to clear out a silver mine south of the village that's currently infested with goblins. Brigid has already received fifty gold pieces for agreeing to take on the mission, and if she is successful, this promises to be a most profitable venture. 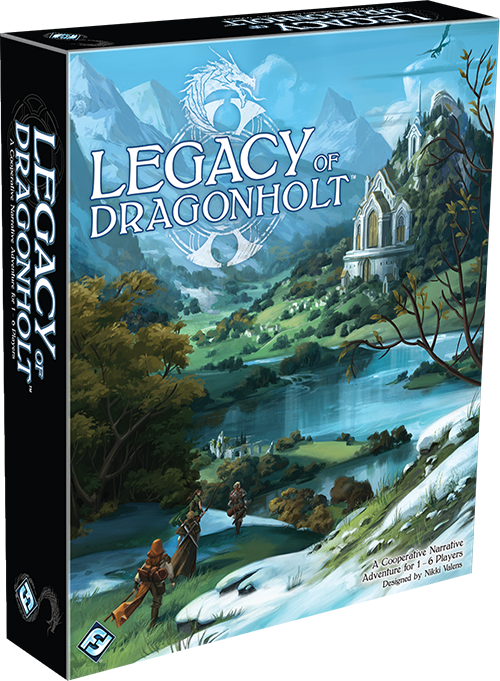 Leave the safety of the village behind and come along with us as we embark on a mission to rid the southern mines of goblins in the Sliver of Silver quest for Legacy of Dragonholt! As Brigid makes her way south of Dragonholt Village, she comes across the concealed emergency passage that Fiore had told her about earlier in the day. Steeling herself for the journey, she lights her lantern and carefully climbs down into the darkness. Along the passage, she comes to a small gap where the tunnel meets a main hallway, but just as she is about to squeeze her way through, she can hear the voices and approaching footsteps of two goblins, idly jabbering on patrol. This is her first big decision—should she ambush the goblins or remain concealed? For Brigid, there are too many unknown factors: how well the patrols are armed, how close any other goblins are, and the general layout of the surrounding tunnels. Considering that she is already outnumbered, she decides to hide until the patrols pass. Here, Brigid hits a bit of bad luck as her lantern hits the cavern wall with a dull clank that echoes down the passage. Lacking the skills to remain hidden once the goblins are tipped off, the two patrols discover Brigid and a skirmish begins. As she feared, one goblin manages to deliver a blow to the head while she is engaged with the other, causing her to lose two stamina. As she is adventuring alone, Brigid had gained a bonus four stamina, setting her max to 18. However, her additional skill chosen during her character creation subtracted two stamina, setting her starting stamina to 16. With this blow her stamina is further decreased to 14. Still, Brigid is an experienced brawler and she manages to knock both goblins unconscious after another moment’s struggle. Continuing down another side passage, Brigid comes across a lone goblin leaning over something on the ground and making small snorty giggles. Whatever the goblin doing, they’re completely preoccupied and don't notice Brigid in the slightest. Never one to pass an opportunity, Brigid draws her weapons and attacks! Surprised, the goblin manages to draw a dagger and slices Brigid’s arm, causing her to lose two more stamina. Roaring in rage, Brigid swings at the creature. “I’m sorry! Please don’t kill me!” The goblin shrieks, tossing away the dagger. Mercifully, Brigid thunks the goblin over the head with the hilt of her weapon and he collapses, unconscious. 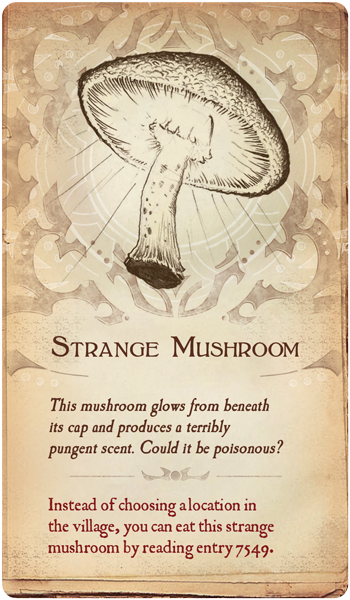 It appears that what held the goblin so enraptured was a Strange Mushroom patch. What on earth could make those so interesting? She takes one as a sample and continues on her quest. Leaving the cavern behind, Brigid follows the main corridor further underground, where she comes across a thick iron door set into the side of the passageway marked “blastworks.” Naturally, Brigid decides to take a look inside, but remembering Fiore’s warning, she is sure to leave her lantern outside. Among the mixing stations (which she has no skill to use) and supply shelves, she spots several crates filled with explosives. The light is worryingly dim, but with her stamina already diminished by two minor encounters, now is the time to arm herself for what may lie ahead. Brigid has no idea what she takes from the crate, and marks story point X8. 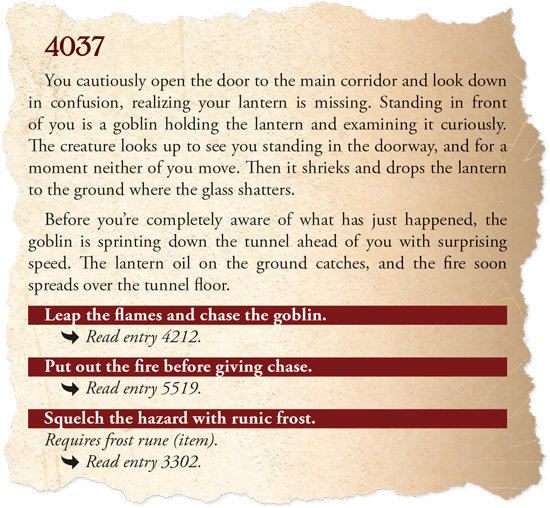 She heads back to the main corridor, but when she walks out, her lantern is in the hands of a goblin! When it spots her, it shrieks and drops the lantern, shattering it, before turning to run down the corridor. This close to the blastworks, Brigid chooses to delay her pursuit and extinguish the fire before sprinting after the coward. Brigid begins to gain on the goblin as she pursues. Time seems to slow as she launches herself at the goblin and its face turns from triumph to abject horror. Using her brawling skill, she brings her weight down on the goblin’s head like a meteor. As she shakes off the tremors of adrenaline, she sees the goblin lie motionless on the cavern floor and takes in her surroundings. A rickety wooden shack that was once a foreman’s office stands braced against a support beam about ten paces away. From behind the shack, still more goblins appear, and one charges at Brigid with a spear. She dodges right, but the goblin manages to land a kick to Brigid’s face before he topples over her, and the weapon is knocked away. This causes our hero to lose another two stamina, bringing her down to a total of ten. Worse, another goblin begins to fire arrows at Brigid. Our dwarf adventurer does not have any ranged weapons and is forced to lunge at the archer in desperation. In the time it takes to close the distance, two arrows slice her skin—nothing fatal, but enough to lose a staggering three more stamina. Only seven left, and this mission is not going as planned. Thankfully, Brigid is able to reach the goblin and knock them unconscious, breaking their bow for good measure. Just as she thinks she may have found some peace, a sound arises like oncoming thunder. In moments, the cavern is flooded with countless goblins. They jeer and brandish weapons and torches, but none attack. Then, from the back of the crowd emerges the single largest goblin Brigid has ever seen. Twice the size of his comrades, as wide as he is tall, this goblin is outfitted in an astonishing array of armor, all too big or too small for him. The vast goblin surveys the room, taking a last bite of a rat on a stick and tossing it aside. “I am Splig, King of All Goblins!” he bellows, throwing his arms wide, spraying bits of half-chewed rat from his maw. This interaction is vital. The village smithy never mentioned the sheer number of goblins living in the mine—Brigid does not stand a chance. But during her character creation, we chose to give her an extra skill, performance, at the price of two stamina. This, combined with the fact that story point X8 is marked, may be Brigid’s only hope to ever see the sun again. Brigid brandishes the explosive she’d taken from the crate and waves it before Splig and his horde of followers. “Ptah,” he spits “That could be dung wrapped in paper! I don’t believe you.” He turns up his chin and fixes Brigid with a defiant glare. Should she back down and try to negotiate, or meet his bluff and see what fate has in store? Well… fortune favors the bold. Brigid’s fate may remain uncertain, but however her tale ends it will be the adventure and the life that she chose. Now, we leave the question to you. How will your story unfold? 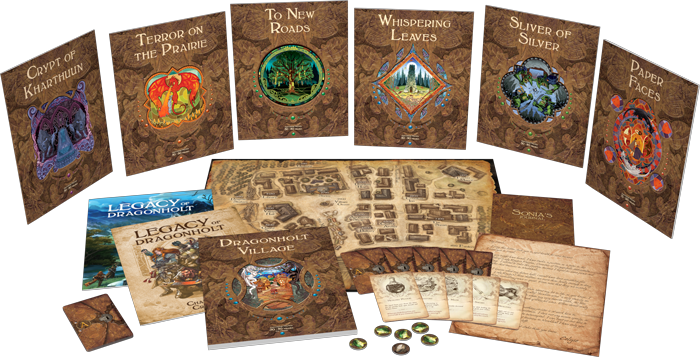 Travel to Dragonholt, dive into the silver mines, and discover the adventure that awaits you!